I made my handmade gifts this weekend (talk about last minute!). They were very simple and I am really happy with how they turned out. Both Hubby's family and my family decided not to do gifts for the adults, this year. BUT, I know that they are all planning to buy for our daughter. 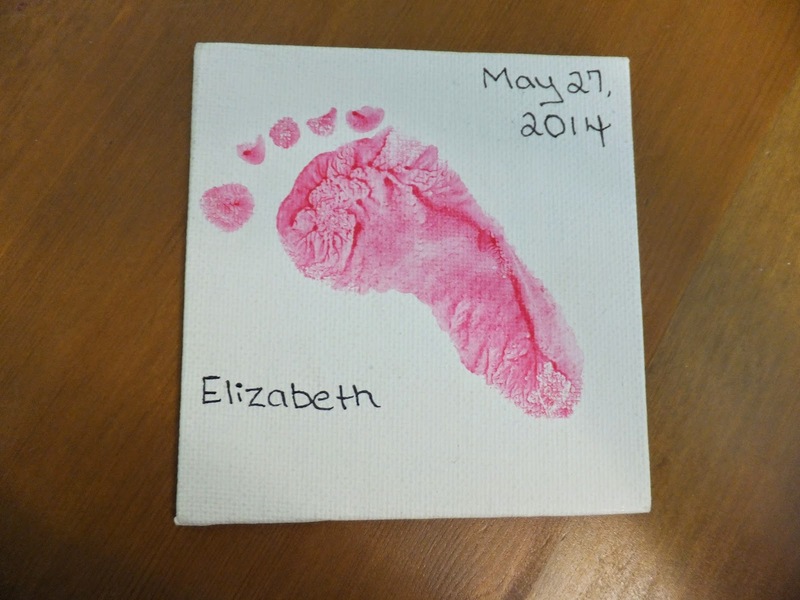 I decided to make a simple, sentimental gift for the family that would be "from" Elizabeth. 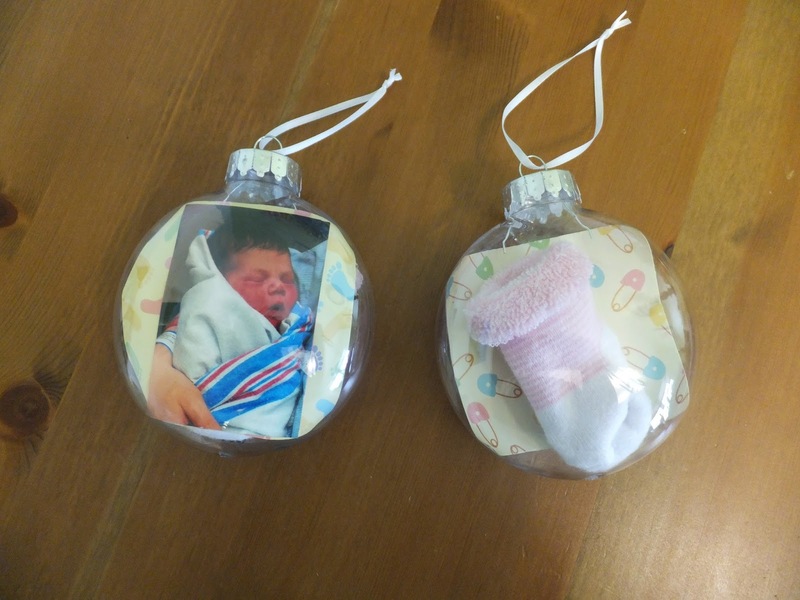 I made each set of Grandparents a Christmas ornament and each Uncle a fridge magnet. You will need a clear plastic ornament, a photo, scrapbook paper, photo safe adhesive and an object that you want to enclose. 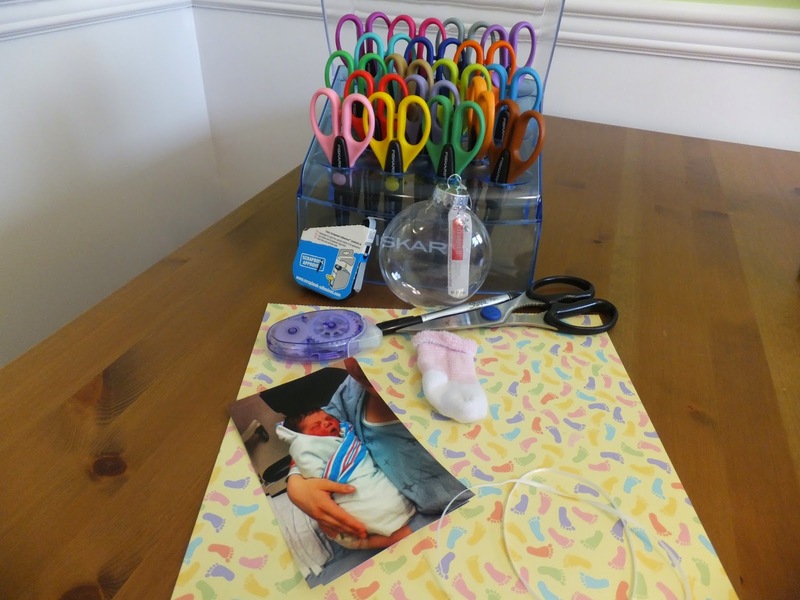 I used the scrapbook paper to make a "barrier" between the photo and the baby sock. 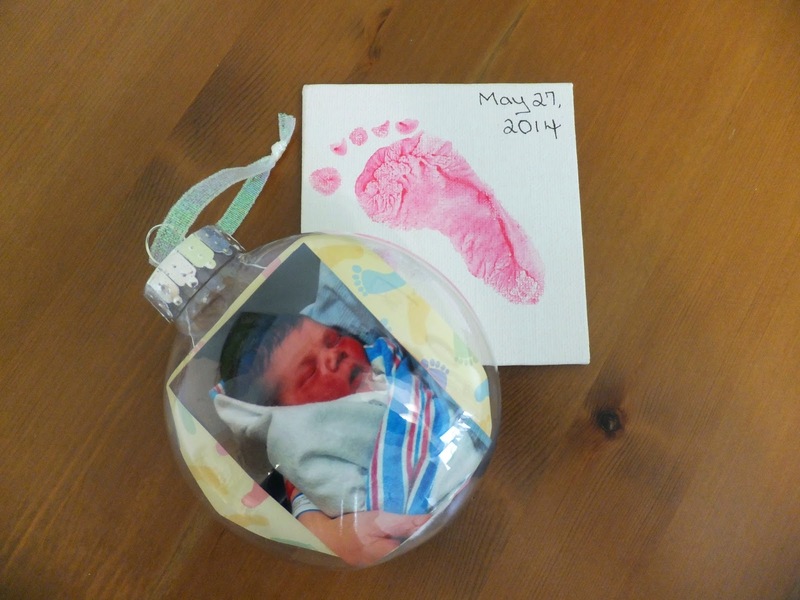 I cut the paper and photo to size and inserted it into the ornament. I had to roll the paper and photo to insert and then I unrolled them once they were in the ornament. On the other side, I put in one of Miss. E's socks from her newborn stage (I can't believe these were too big on her at first!). This gift is extremely easy to customize. You could include a picture of your honey and you at a concert and include the ticket stubs. You could do a pet themed one for the pet lover in your life. The possibilities are endless! Here is my final result (front & back). The total cost of this gift was about $2.30 each. I made magnets for the Uncles using 4" X 4" mini canvas panels. 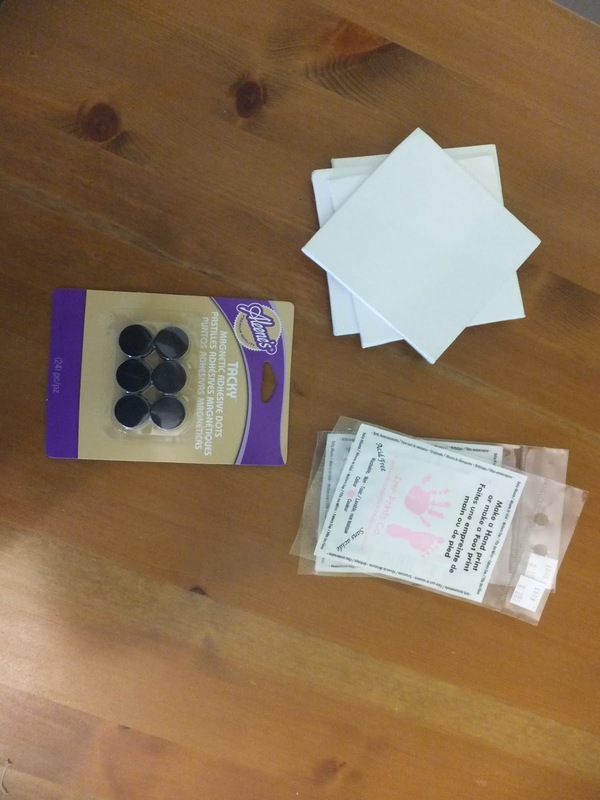 I used the canvas panels, infant safe ink (be sure to buy ink that is specifically designed for use on infant skin) and magnetic adhesive dots. I first painted Miss. E's foot with the ink and, with Hubby's help (help is important if you don't want ink absolutely everywhere! 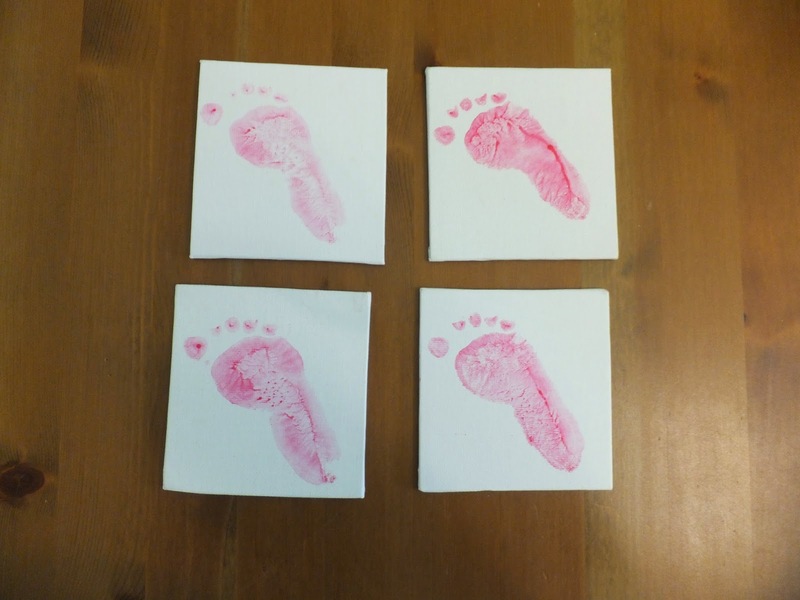 ), stamped her foot on the canvas panels. I washed her foot while the canvas panels were drying. It didn't take long for them to dry! 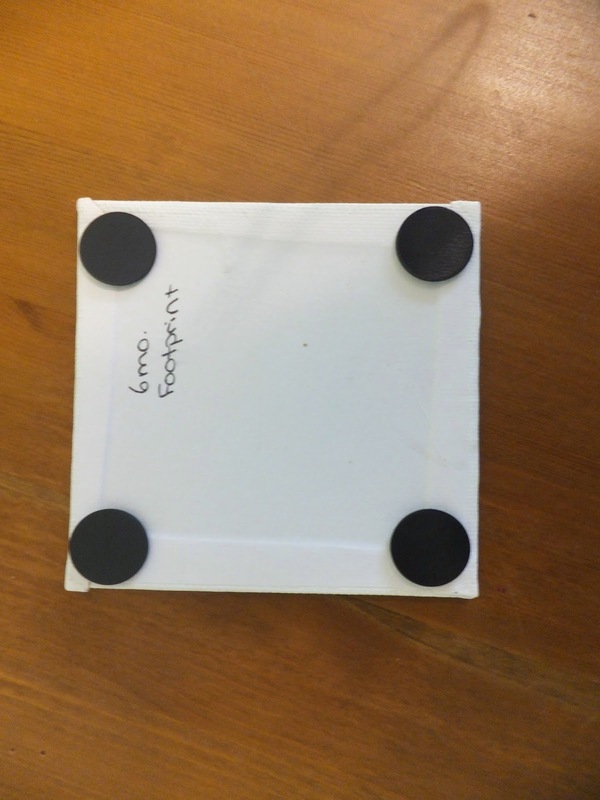 I stuck the magnets on the back and presto! All done! Super easy! This craft cost about $3.48 for each panel. I was pleased with how the gifts turned out. I hope my recipients like them! I will be back on Wednesday for a double edition of #wardrobewednesday to make up for last week's lack of planning!